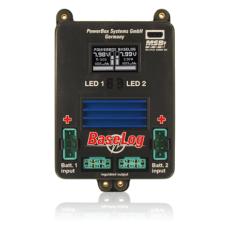 The PowerBox BaseLog combines high performance capacity with excellent battery monitoring facilities, as it includes the option of sending battery-relevant data directly to the transmitter’s screen. The PowerBox BaseLog combines high performance capacity with excellent battery monitoring facilities, as it includes the option of sending battery-relevant data directly to the transmitter's screen. Like all PowerBox battery backers, the PowerBox BaseLog features completely redundant construction. The regulators, the switches and even the micro-controllers which are responsible for the on / off switching process, are duplicated in a consistent manner. The essential battery type information is entered using a menu system and the integral OLED screen, with the help of the SensorSwitch supplied in the set. The telemetry interface is simply connected to the receiver using a patch-lead; the TM1000 telemetry module is only required for Spektrum equipment. The receiver sends the data directly to the transmitter's screen. Alarms - such as battery failure - are also generated at the transmitter itself. The high-resolution OLED screen displays the voltage and residual capacity of both batteries, as well as the output voltage actually present. 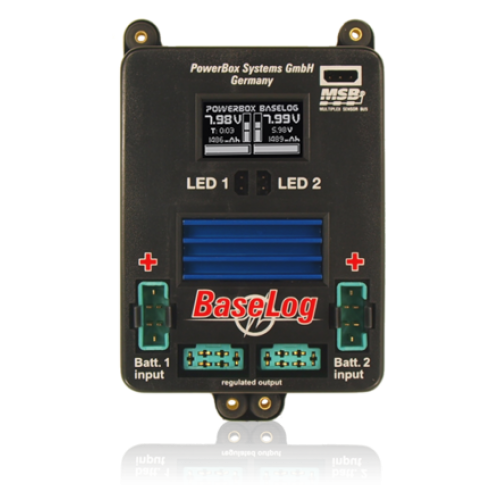 The BaseLog delivers a regulated output voltage of 5.9 V or 7.4 V, making it a great choice for standard 6.0 V servos as well as HV systems. In both cases the constant output voltage ensures consistent running and extended effective life for your servos. Power is fed to the receivers via the two patch-leads supplied in the set. Optional patch-leads are also available to suit high-current inputs, which are now fitted to a number of receiver types.